A third-century Roman fortification with remains of a triumphal arch that may mark the spot where the Romans first came ashore for their successful AD 43 invasion of Britain. 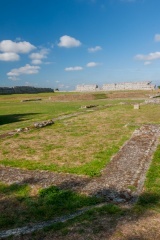 Later, an early Christian church was built within the walls of the Roman fort. There are inner and outer earthworks and extensive remains of fortifications. 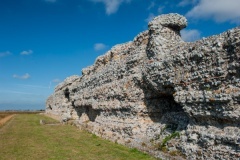 Richborough is memorable in that it was occupied from the successful Roman invasion of AD 43 until the departure of the Romans from Britain in AD 410. 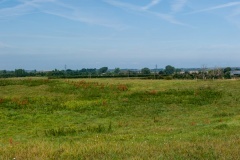 At the time of the Roman invasion the area around Richborough looked very different to what it does today. At that time Richborough was an island in a natural lagoon at the southern end of the Wantsum Channel, linked to the mainland by a causeway. This created a natural harbour that was ideal for the invading Romans to establish a presence in southern Britain. 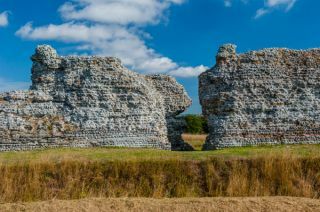 Historical accounts do not make clear exactly where the Romans landed, but Richborough seems a prime candidate to be the 'Ritupaie' mentioned by historian Cassius Dio. The first military fort here was quite basic; it was intended as a beachhead in enemy territory, not a permanent military camp. 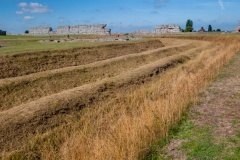 There are two parallel ditches which extend for almost 2200 feet, well beyond the present fort, and must have cut the Richborough promontory off from the mainland. There was an earth rampart on the seaward side of the ditches, and the site was entered through a timber gateway. 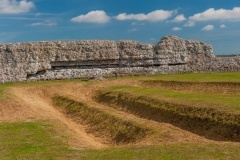 By the middle of the 1st century, Richborough was one of the primary supply bases for the army. It was only when the Romans had begun to establish control over Britain that Richborough changed its role. The final success of the invasion was marked by a large triumphal arch in the centre of the fort, at the junction of a crossroads. It is the arch that provides Richborough with one of its most intriguing features. Though there is little of the actual arch remaining, the raised earthen banks, forming a large cruciform structure, and traces of foundation walls indicate a hugely impressive building, with decorated arches facing in four directions. Sometime around AD 85 the timber buildings used for the army supply base were torn down, making room for a large masonry gateway, symbolically representing a formal entrance to the new Roman province of Britain. Built at the junction of four roads, with an arch facing each road and a raised cross passage through the centre, the gateway was erected on a raised rectangular foundation of flint and mortar. The gateway measured roughly 85 feet high and was constructed out of ashlar encased in Carrara marble imported from Italy. The gateway was richly decorated and had niches for bronze statues. So fine was the stonework that much of it was reused in building the west gate of the later fort after the gateway was destroyed. The importance of Richborough as a supply base faded as the role of Dover increased, but the port and the town that grew up around it still thrived. One piece of evidence for the busy town is a mansio, or hotel for official visitors. There was a timber building on this spot in the 1st century, but during the 2nd century this was rebuilt in stone. When the 3rd-century fort was built the mansio fell out of use. a bath house was built on top of the earlier building, including a changing room, cold bath, warm bath, and hot room. In the 3rd century defence became important once again, as the south coast came under threat from Saxon raiders. Around AD 250 an elaborate system of earthwork defenses was erected, and it is these concentric series of earthworks that gives Richborough its most eye-catching feature. The central area of the town was levelled to build an earthwork camp enclosing about 1 acre. The earthen defences included three ditches and an internal rampart, accessed by a single gate on the western road Though most of the earlier buildings were demolished to make way for the new fort, the mansio was left untouched. In fact, the ditches seem to have been carefully aligned to avoid damage to the hotel. The monumental gateway was converted to use as a lookout. 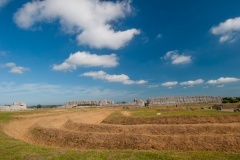 The first earthen fort lasted only about 25 years before the ditches were backfilled and the defences rebuilt in much more elaborate fashion, surrounded by high stone walls. This last stone fort was part of the new Roman series of Saxon Shore forts on both sides of the English Channel. The new rectangular fort was manned by soldiers of the Second Legion and defended by high walls of flint and stone with regular towers on all sides. There was a single gate in the centre of each side, with a double row of external ditches, save on the west, where the Roman builders dug three ditches, apparently by mistake. Most of the buildings within these strong walls were of timber, except for the bathouse on the mansio site, and a pair of stone buildings that might be temples. 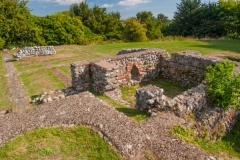 Roman rule came to an end in the early 5th century when the last troops were withdrawn, but Richborough continued to be occupied, as evidenced by a small Saxon chapel near the earlier mansio. The chapel, dedicated to St Augustine, was built in the late Saxon period (c. 900) with a rectangular nave and chancel and a west porch. in the 12th century, a rounded apse was added at the eastern end, and the chapel was finally pulled down in the 17th century. 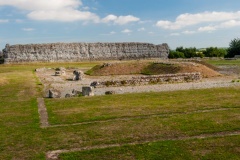 Though English Heritage promotes the nearby amphitheatre as part of the Richborough experience, it is not signposted, nor is access terribly straightforward. We had to ask the attendant at the visitor centre, and she showed us an aerial photograph and explained how to reach the site by footpath. Even then, we mistook the way and wandered about until we chanced upon the right location. And having taken the trouble to reach the site, we found the amphitheatre to be a disappointment. Though it certainly looked impressive in the aerial view, at ground level there is little to see beyond a depression in the broad hilltop. If you are interested in seeing the amphitheatre I suggest a good OS map, or at the very least get good directions from the visitor centre! Lest that sound too negative, let me counter that by repeating just how impressive we found Richborough fort. The scale of the earthworks and the height of the walls was enormously impressive. It truly is a remarkable site, full of interest. I loved it!